Hyundai India has unveiled the Venue compact SUV today evening in grand style in the Arabian sea. The vehicle has been revealed in front of the media today evening while the official launch with price announcement will take place next month. 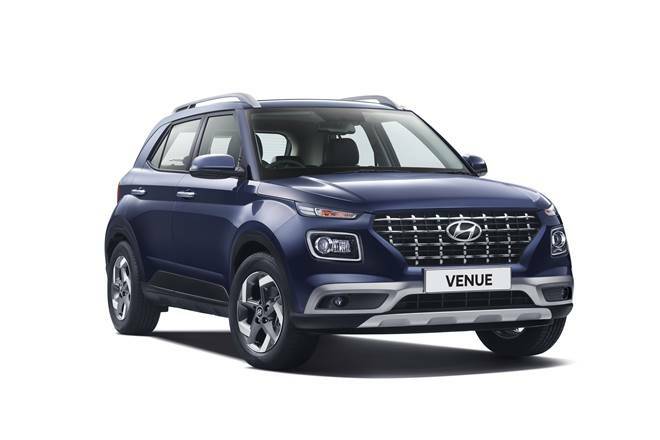 Hyundai Venue has been unveiled today and the compact SUV is a big step taken by the company in the direction towards connected vehicles. 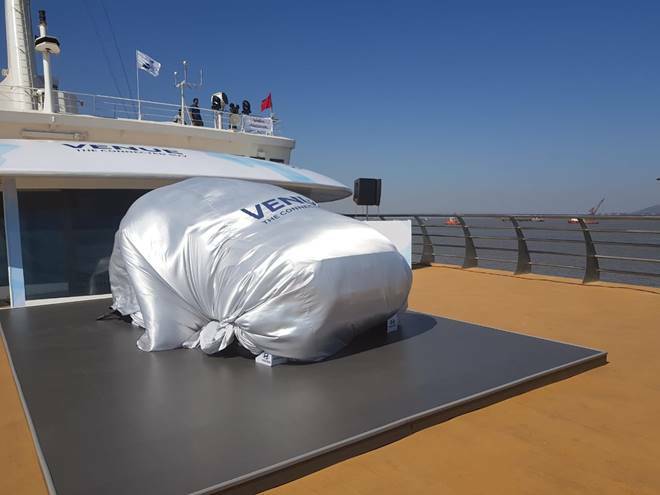 The official unveiling of Hyundai Venue has taken place amidst the Arabian sea in a grand style at a cruise ship that is currently heading towards Goa from Mumbai. 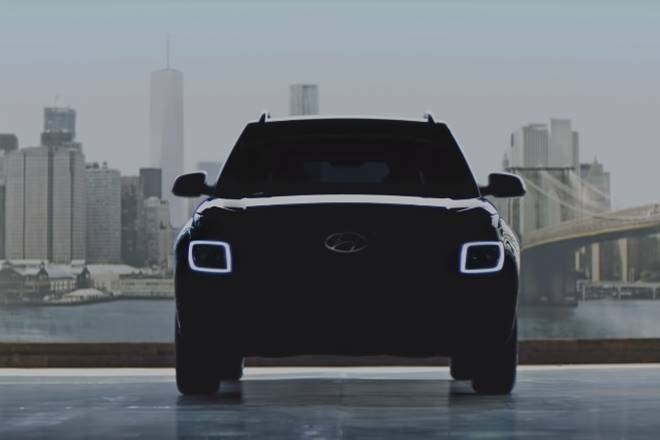 Hyundai has been teasing the Venue in its teaser video series for quite some time now in which the SUV was seen undergoing test runs through multiple locations across India. Starting with the visuals of the SUV, the Hyundai Venue gets sleek LED DRLs up front and there is a high possibility that these will remind you of the Tata Harrier and the MG Hector. However, the biggest highlight of the SUV is the Blue Link technology that will give it a major edge in front of its competition. 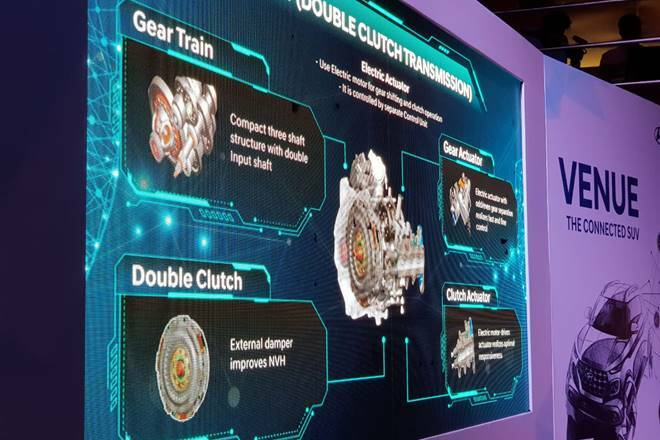 The technology gets 33 connected features and the interesting part is that out of these, 10 have been made India specific. The Hyundai Venue gets power from three engine options. These will come with choices of a six-speed manual and a seven-speed automatic DCT (Dual Clutch Transmission) system. The upcoming Hyundai Venue will rub shoulders against the likes of the Maruti Suzuki Vitara Brezza, Tata Nexon and Ford EoSport in the segment. The official launch of the Venue along with its price announcement will take place on 21st May. The 1.0-litre petrol engine on the Hyundai Venue will come with seven-speed DCT and six-speed manual transmission options. On the other hand, the 1.2-litre petrol engine will come with a five-speed manual while the 1.4-litre diesel engine will be mated to a six-speed manual gearbox. The upcoming Hyundai Venue will come with three engine options. 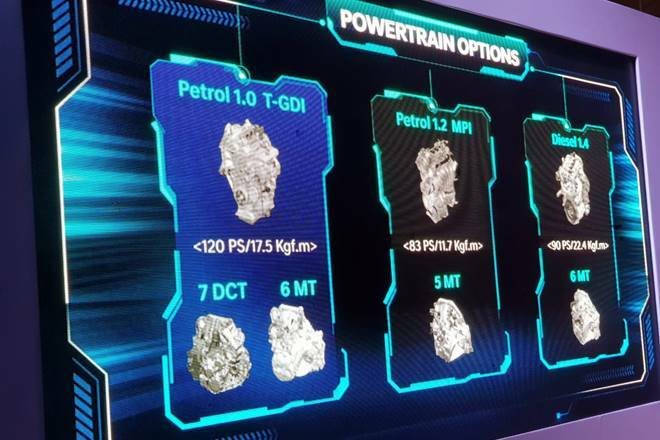 The 1.0-litre petrol engine will be good for producing maximum power and torque outputs of 118 bhp and 172 Nm respectively. Second up is a bigger displacement 1.2-litre petrol engine on offer that develops 82 bhp of power and 115 Nm of torque. Last, the Venue will get a 1.4-litre diesel motor that sheds out a peak power output of 89 bhp while the maximum torque is rated at 220 Nm. And the Hyundai VENUE is finally here! There you have it folks! The Hyundai Venue has been unveiled finally after much anticipation and excitement. The compact SUV will challenge the likes of Maruti Suzuki Vitara Brezza, Tata Nexon, Mahindra XUV300 and Ford EcoSport in the segment. Official India launch of the Venue will take place next month. Check out the picture from the cruise. Hyundai drops in another teaser! While the India unveil event of the Hyundai Venue is underway, the company has dropped another teaser of the compact SUV in the meanwhile. As you can see in the image, the vehicle will come with square LED DRLs and the headlamps will be housed within. Moreover, the Venue will also get an additional pair of sleek LED DRLs above the headlamp set up. Does it remind you of the Tata Harrier? The biggest USP of the Hyundai Venue is its Blue Link technology that will give it multiple benefits over the competition. The tech comes with 33 features out of which 10 have been made specifically keeping the Indian market. The press conference is underway at the cruise ship on which the Venue will be unveiled. Stay tuned for all the action! That's it folks from the India unveil event of the Hyundai Venue. One of the most interesting events that we have covered so far. The compact SUV will be launched in India next month on 21st. Until next time, drive/ride safe. Goodbye! So the moment is about to come for which you and we have been waiting for so long. The Hyundai Venue is set to be unveiled in India at 8.30 PM which is just 10 minutes from now. Keep refreshing the page if you don't want to miss any action from the unveiling event. 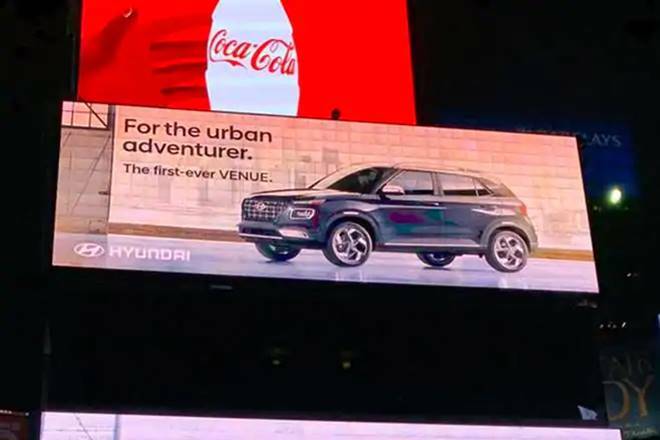 The Hyundai Venue was leaked a couple of days back when the SUV was shown at an advertorial at Times Square. This is the first time when the Venue appeared completely without any camouflage. Check out the image below. The upcoming Hyundai Venue will come with multiple advanced safety features and these include a panic button. A panic button is something that will be present on the key fob and on pressing it, the car will call four predefined numbers in order to alert them of an emergency situation along with the location. Another India first feature on the upcoming Hyundai Venue is called the push maps through call center. As it sounds, this feature allows the driver to connect to Hyundai call center and request for a specific location. After this, the location will be pushed in the vehicle by the call center. The upcoming Hyundai Venue will come with alert services as well that will allow the customer to set multiple limits for speed, time, valet alert and area. Whenever any of the said limits are breached, the car owner will receive an alert on his or her phone immediately. This feature will prove really handy for parents who do not want their children to go beyond a certain speed. The upcoming Hyundai Venue gets multiple safety features like dual front airbags along with seat belt reminder, ABS (Anti-Lock Braking System) with EBD, rear parking sensors, speed alert system and more. The upcoming Hyundai Venue will come with generous dimensions and will have overall body length of 3995mm x 1770mm x 1590mm (LxWxH). Furthermore, the vehicle will have a wheelbase of 2500mm. The minimum ground clearance figure of the Hyundai Venue is currently unknown but after seeing the SUV undergoing test runs in significant off-road scenarios, the figure should be somewhat respectable. The upcoming Hyundai Venue will get the company's Blue Link technology that will get 33 connectivity features and interestingly, 10 out of these are India specific. This means that the Venue will come with multiple segment features that only Indian customers will get. In the next updates, we will be sharing what all features does the Blue Link technology packs in and why it is an important highlight of the Venue. Here we bring you another image from the cruise guys! Our colleague has just sent another picture from the Hyundai Venue India unveil venue. From this particular angle, the compact SUV will remind you of the Creta with the similar creases and lines. More information on the Venue to be revealed soon, so stay tuned with us for all the updates! Why Hyundai Venue can be a game changer? The compact SUV segment has become quite popular in a short period of time. While there are currently multiple challenging players like Maruti Suzuki Vitara Brezza, Tata Nexon and Ford EcoSport in the segment. 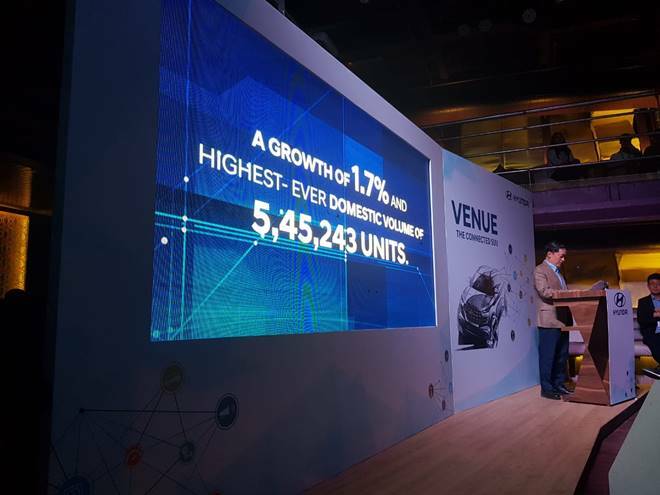 In such a case, Hyundai is betting big on the Blue Link technology that will make the Venue the first smart connected car in India. The SUV will come with multiple segment first features and if priced well, it can set the sales charts on fire. The Hyundai Venue will primarily lock horns with the likes of the Maruti Suzuki Vitara Brezza, Tata Nexon and Ford EcoSport in the segment. This will be in terms of price point. On the features front though, the Venue will feel the heat from the MG Hector as the two SUVs will make entry as smart connected vehicles. Hyundai Venue press conference has started at the cruise ship that is heading to Goa. The company is currently revealing its performance numbers for India and the figures show that the brand is doing pretty good in the country. Hyundai says that it has achieved a growth of 1.7 percent while registering the maximum domestic sales of 5,45,243 units. Here you can see the Hyundai Venue in wraps at the cruise ship. 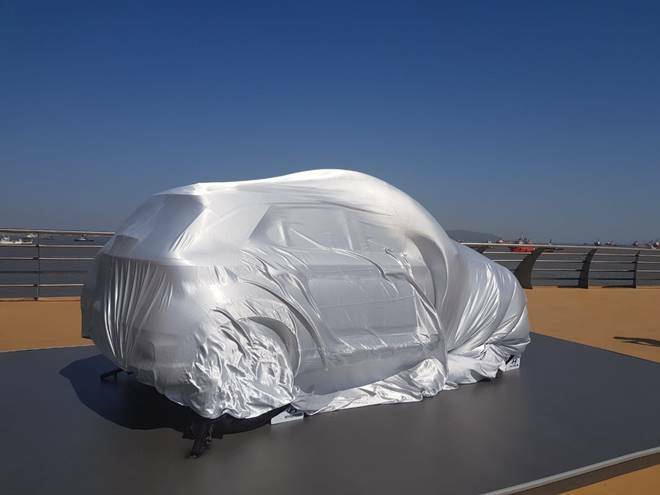 The compact SUV will be revealed to the media soon. The cruise is heading to Goa from Mumbai and the SUV will break cover in the Arabian sea during its journey. For now, here is the image of the Hyundai Venue from the ship for you to make you wait in more anticipation. Hyundai Venue to be unveiled in grand style! The Hyundai Venue compact SUV will break cover in grand style amid the Arabian sea. Being an important product for the brand, Hyundai has made a perfect setting for the unveiling of this SUV. The Hyundai Venue will be revealed on a cruise ship that is currently on its way to Mumbai to Goa. The Angriya cruise ship on which our colleague and other journalists friends are travelling is India's first luxury passenger cruise ship. Hello folks! Welcome to the Hyundai Venue live blog. The highly awaited SUV is set to make its official debut today. In India, the vehicle will be revealed in grand style. Sit back, relax and enjoy the proceedings of the Venue India unveil event as we will be bringing you instant updates straight from the 'venue'. The Hyundai Venue - India's first connected SUV will feel the heat from the likes of Maruti Suzuki Vitara Brezza, Tata Nexon and Ford EcoSport in the segment. 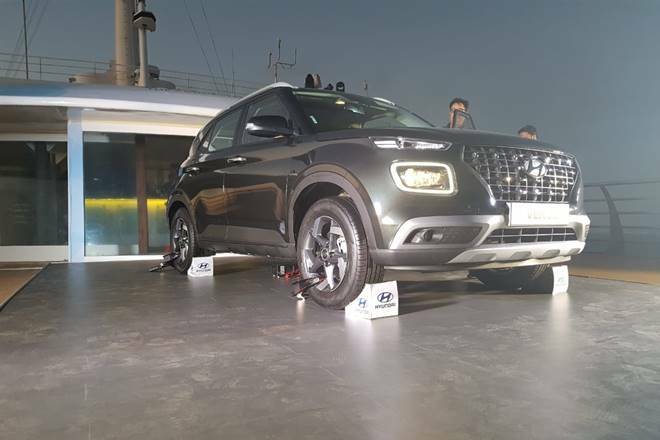 The compact SUV by Hyundai gets Blue Link technology with as many as 33 connectivity features out of which 10 are India specific. Looking at the comprehensive feature list, the Venue can be a game changer in its class if priced well.